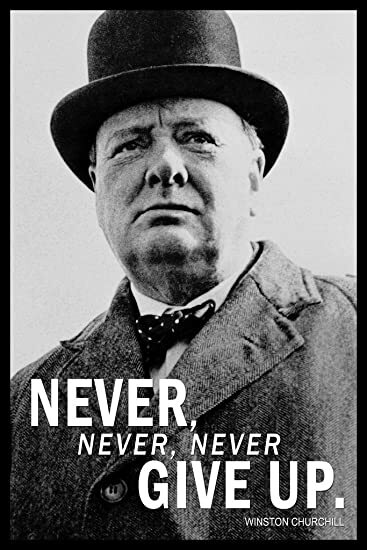 Steven Schussler quotes Winston Churchill in his book It’s a Jungle in There in support of his assertion that successful entrepreneurs are persistent. What doesn’t get mentioned is that Churchill never said those exact words. Ultimately, it doesn’t matter that Churchill is misquoted more often than not. The sentiment remains valid. What I appreciate, however, in the accurate quote, is that Churchill’s wisdom and ethical boundaries shine through. He infuses thoughts of honor and good sense in addition to the virtue of persistence. Dogged determination without considering the human consequences is not virtuous. The end does not justify the means in every case, so congratulating ourselves when we accomplish our goals if the cost was crushing the people in our path is wrong. A true victory is won when goals are accomplished without harm, or better yet by elevating other people along the way. Churchill also points to the use of “good sense” when applying persistence. I’m not 100% sure that Schussler would agree with Churchill on this point, given his propensity for applying the blood, sweat, and tears and off the wall approaches to his endeavors. When he shipped himself to a hiring manager in a barrel without air holes or turned his house into a functioning jungle it would be hard to argue that Schussler was practicing good sense. He has shown a preference for creativity and making a memorable impression over doing what most would consider good sense. These differences are a great reminder to me that we all have to approach our businesses in our own way. It is our differences that make the world interesting, and if there were a “formula” for entrepreneurial success then there would be a lot more successful entrepreneurs. You have to be willing to push through the hard times to achieve your goals, but you also have to recognize when the right time is to take the lessons from one endeavor and move on to the next. I agree that acting with integrity is essential in business. We should communicate in a respectful way with everyone and develop positive relationships.